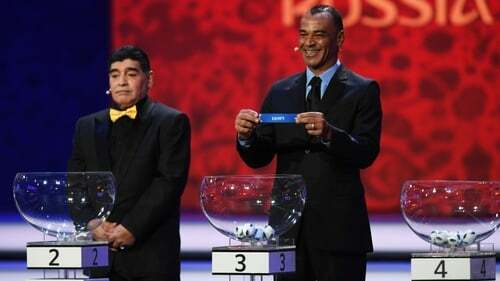 Hosts Russia and England will both be thanking their good fortune after today's 2018 FIFA World Cup draw in Moscow handed them what look to be relatively weak groups. Russia will play Saudi Arabia in the opening fixture of the tournament at the Luzhniki Stadium in Moscow on 14 June before also facing Uruguay and Egypt in Group A. The final takes place at the same venue on 15 July. England are second seeds behind Belgium in Group G but will fancy their chances against Tunisia and tournament debutants Panama. England have never lost to Belgium at a major tournament and have only lost one of their 21 matches against their European counterparts. An Iberian derby between Portugal and Spain will be the highlight of Group B, with Iran and Morocco rounding out the group. The Republic of Ireland's play-off conquerors Denmark will take on 1998 winners France, Peru and Australia. Argentina's Group D is one of the tougher pools, they will compete against Croatia, first-timers Iceland and familiar foes Nigeria. Early favourites Brazil also have a difficult assignment - Group E features two European sides in Switzerland and Serbia, and Costa Rica, who progressed from England's group in 2014. Germany will be confident of topping Group F ahead of Mexico, Sweden and South Korea while a line-up of Poland, Colombia, Senegal and Japan makes Group H look one of the most evenly matched.